1920s cotton buyer Earle Dickson worked for Johnson & Johnson and had a klutzy wife who often cut herself. The son of a doctor, Earle set out to create an easier way for her to bandage her injuries. Band-Aids were born, but Earle's bos Did you know Band-Aids were invented by accident?! And that they weren't mass-produced until the Boy Scouts gave their seal of approval? To ask other readers questions about The Boo-Boos That Changed the World, please sign up. A young couple meet and marry. Josephine is prone to accidents and getting cuts. Her husband, Earle, has a father that is a doctor and Earle works in medical supplies. You know what happens next: Earle creates the Band-Aid. This is the evolution of what we now know as our go to bandage. They even mention the red strip you pull down the side. If you are from my generation, you remember opening this band-aid and the satisfaction of getting that strip perfectly down the side. The Boy Scouts help po A young couple meet and marry. Josephine is prone to accidents and getting cuts. Her husband, Earle, has a father that is a doctor and Earle works in medical supplies. You know what happens next: Earle creates the Band-Aid. The Boy Scouts help popularize the band-aid and soldiers were sent them during WWII. Ouch! Ow! My gosh that hurts! We all get boo-boos. Cuts, scratches, scrapes, brush burns and the like and in that instance, that moment of pain and discomfort, it is likely that you may have covered it right up with a Band-Aid. It calms the tears of our little ones and eases our way back to the task at hand for many. But had you ever thought about who invented this handy little essential piece to every first-aid kit? Why was it invented, when, and how? As Barry Wittenstein points out in his Auth Ouch! Ow! My gosh that hurts! We all get boo-boos. Cuts, scratches, scrapes, brush burns and the like and in that instance, that moment of pain and discomfort, it is likely that you may have covered it right up with a Band-Aid. It calms the tears of our little ones and eases our way back to the task at hand for many. But had you ever thought about who invented this handy little essential piece to every first-aid kit? Why was it invented, when, and how? As Barry Wittenstein points out in his Author Note, "Every invention has a history." Most inventions are created out of necessity. They are invented "because they fill a need" (Wittenstein). In The Boo-Boos That Changed the World, we learn that Earle Dickson's (New Brunswick, NJ) inventing the Band-Aid came out of a desire to help his wife Josephine who was prone to getting cuts and burns and well, you know, boo-boos. He wanted to help her alleviate the pain and stop any bleeding in a way that was safe and sanitary so that she could comfortably get back to business. Realizing that this need went beyond simply helping his wife, Earle took his idea to his boss who agreed to produce and sell Band-Aids. They were used by Boy Scouts, soldiers, and eventually people all over the world. What I enjoyed most about this book is the glimpse that it provides into the creative, inventive process. Starting with the desire to fill a need, to seeing Earle thinking and brainstorming, until he has that aha, light bulb moment, to testing things out through trial and error. Giving the reader a chance to see what worked and what didn't. An authentic look at the work that goes into inventing. Interesting story about a product used frequently today (I think I hand out as many adhesive bandages as the nurse does! ), with charming illustrations. I'm not sure I'll include it in my middle school library, since most of the story is fictionalized, and I tend toward more informational picture books. Also, I must have read this on a bad day, because I kept thinking horrible things about why the wife kept cutting herself. Did she have some sort of degenerative nerve disorder? Was it self-abuse? Did her husband torture her? We will put this down to the persistence of snow in Ohio and my resultant poor frame of mind. I would definitely purchase this for a public or elementary school library. As a newlywed, Josephine is accident-prone, especially in the kitchen working with knives. Luckily, her husband Earle knows early 20th Century medical supplies, so he can help Josephine with first aid for her “boo-boos.” Earle wonders if there might be a simpler way to bandage small cuts. This curiosity launches the narrative of Barry Wittenstein’s The Boo-Boos that Changed the World, a picture book biography about the inventor of the Band-Aid that highlights the creative process involved in inv As a newlywed, Josephine is accident-prone, especially in the kitchen working with knives. Luckily, her husband Earle knows early 20th Century medical supplies, so he can help Josephine with first aid for her “boo-boos.” Earle wonders if there might be a simpler way to bandage small cuts. 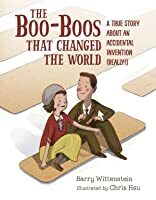 This curiosity launches the narrative of Barry Wittenstein’s The Boo-Boos that Changed the World, a picture book biography about the inventor of the Band-Aid that highlights the creative process involved in inventing, manufacturing, and marketing what is now a common household item. This book’s narrative voice is full of fun exclamations and false endings that make it an excellent choice for a read-aloud. The details here make the learning “sticky”—pun intended—as readers will remember the back story each time they reach for Band-Aids. The Boo-Boos that Changed the World includes extensive back matter, including an especially useful “Other Medical Inventions from the 1920s and 1930s” timeline to provide context for Josephine and Earle’s story. A tale about perseverance, a little bit of luck and a whole lot of boo-boos, this inspirational, biographical picture book should be read aloud and discussed by every teacher. First sentence: Once upon a time, in 1917 actually, a cotton buyer named Earle Dickson married his beloved, Josephine, and they lived happily ever after. The end. Actually, that was just the beginning. The newlyweds expected to live a quiet life in New Brunswick, New Jersey. Instead, Earle and Josephine ended up changing the world, one boo-boo at a time. Premise/plot: This is a nonfiction book about the inventor of the band-aid. There is a personal story behind this invention. My thoughts: I found First sentence: Once upon a time, in 1917 actually, a cotton buyer named Earle Dickson married his beloved, Josephine, and they lived happily ever after. The end. Actually, that was just the beginning. The newlyweds expected to live a quiet life in New Brunswick, New Jersey. Instead, Earle and Josephine ended up changing the world, one boo-boo at a time. Barry Wittenstein clearly has a great sense of humor, because during the telling of this interesting story, he's made me laugh quite a lot. Certainly, I did not laugh when he began after Earle Dickson married his sweetheart, Josephine, and discovered that she had lots of small accidents, like tiny cuts when preparing dinner. And sad to say, all she had to stop the bleeding was a kitchen rag. Barry's father was a doctor so he knew all about infections, and Barry worked for a company that made ho Barry Wittenstein clearly has a great sense of humor, because during the telling of this interesting story, he's made me laugh quite a lot. Certainly, I did not laugh when he began after Earle Dickson married his sweetheart, Josephine, and discovered that she had lots of small accidents, like tiny cuts when preparing dinner. And sad to say, all she had to stop the bleeding was a kitchen rag. Barry's father was a doctor so he knew all about infections, and Barry worked for a company that made hospital supplies. You could say he knew a thing or two. He devised a long strip of tape with some gauze every so often. Josephine loved it, just needed to cut off a strip to wrap her finger. It was an invention full of love, but that long strip became a problem! Wittenstein might have ended the story then, but no, more than once he "almost" wrote, "The End", yet he knew more he wanted to tell! This new "bandage" that helped with "first aid" was eventually named "Band-Aid". That long, long strip was labor intensive to produce, a shorter one was invented, and the rest was almost history. But not yet. That's where the humor continues. Now they had to figure out how to produce them faster. Then, there was a bigger problem, no one would buy them! Digging deeper, the author has created a story that really has no end. After the Dicksons passed away in this 21st century, companies have created all kinds of shapes, sizes, and colors. Also, now they can be found 'latex-free'. This story has not ended yet. Bookaday #32. 5 stars. Fabulous nonfiction for young readers, about a product they are all familiar with! Love the writing style, easily a hit as a read aloud. Engaging illustrations and back matter. A biographical picture book of Earle Dickson who invented the band-aid for his accident-prone wife, and how his invention grew in popularity. So the title of this is a play on words. Dickson didn't invent the band aid by accident, but he invented it for an accident. And when he decided to develop it for market it wasn't super popular at first. The way they got the band aid to catch on was an interesting look at a marketing scheme. A fascinating picture book history of an everyday item we take for A biographical picture book of Earle Dickson who invented the band-aid for his accident-prone wife, and how his invention grew in popularity. So the title of this is a play on words. Dickson didn't invent the band aid by accident, but he invented it for an accident. And when he decided to develop it for market it wasn't super popular at first. The way they got the band aid to catch on was an interesting look at a marketing scheme. A fascinating picture book history of an everyday item we take for granted and an everyday man who became an inventor. I like the author's playful narrating voice. Recommended for STEM reading, medical history, business-minded readers, and fans of biographies of ordinary people. Barry Wittenstein is very witty. I brought this book into my second grade classes for the fall of 2018. The kids enjoy it every time he ends a page with "the end". After the first page they exclaim each time "NO". It is a fun way to start my visit to their classroom. I also bring in a box of band-aids to show them the Johnson & Johnson brand name. Its such a fun read for me to share! Great book about a common item. I love the structure of the book. This informative & fun non fiction picture book answers the question, how and why bandaids were invented. Thank you @charlesbridgepublishing for sending us a review copy. All opinions are our own. . The Boo-Boos That Changed The World - A True Story About An Accidental Invention (Really!) by Barry Wittenstein & Illustrated by Chris Hsu is a true winner! . Maybe I am in a minority, having collected bandaids as a kid, but I had wondered about the first bandaids. Even if you have never wond This informative & fun non fiction picture book answers the question, how and why bandaids were invented. Thank you @charlesbridgepublishing for sending us a review copy. All opinions are our own. .
Maybe I am in a minority, having collected bandaids as a kid, but I had wondered about the first bandaids. Even if you have never wondered about the invention, the written style Barry takes on is fun and grabs reader’s attention. He weaves in the history with a sweet love story of how Earle Dickson created the first bandaid to help his accident prone wife. (Isn’t that adorable??) It’s not just a love story, but we find out that Earle is determined, hard-working and doesn’t give up. All character traits the kids will want to hear about! Chris’ illustrations are warm and his characters are inviting that you feel like you know them. I was really looking forward to reading this, and found the story interesting (the end). Not yet, actually, the illustrations really captured me, and I wanted to know more as I read more (the end). Almost. However, the author's constant use of breaking up the text really began to irritate me (the end). Just kidding, but do you see what I mean here? This constant "the end" stuff is vexing (the end). I didn't know what a debt of gratitude I owed Earle and Josephine...Like her, I'm klutzy and often run into things that end up hurting me. Lucky for me and Josephine, her loving husband, Earle, invented bandages (later named 'band-aids') to cover her wounds and help the heal. A clever story told with humor that gives us real information...how the world ended up with bandaids! This is how all historical books for children should be done! Author added just the right amount of humor to fact to make a throughly enjoyable read aloud about how Band-Aids were invented. What kid can’t relate to boo-boos and Band-Aids??? Great way to throw in some American history into your read aloud time. Our goddaughters loved this book and had me read it a total of 4 (maybe 5) times in their short visit. It is based on a true story about the invention of band-aids and was pretty cute, especially since the story kept "ending". A delightful telling of how band-aids were invented. What a great story! I love the layout too. The End. Oh wait! Clever way to expose the history of the Band-Aid®. Great illustrations, too! This review has been hidden because it contains spoilers. To view it, click here. Another “STEM” book that does not feel like it’s pushing it’s way onto my STEM shelf. The story of the Band-Aid is woven through interesting, engaging text that will appeal to a wide range of readers. Rather simple cartoonish illustrations adequately support the text, and have a distinctive brownish-tan color scheme...hmmm, what does that color remind me of....? I especially appreciate the discussion of how items aren’t ‘just invented’ - that there is a process of improvement, and the best inventi Another “STEM” book that does not feel like it’s pushing it’s way onto my STEM shelf. The story of the Band-Aid is woven through interesting, engaging text that will appeal to a wide range of readers. I especially appreciate the discussion of how items aren’t ‘just invented’ - that there is a process of improvement, and the best inventions are usually the result of a perfect storm of situations. Every invention has a history, but there are some things just so common we rarely give them much thought. Readers will be entertained and informed by the story of how the band-aid was invented and how they were first used. Barry Wittenstein has an engaging writing style that brings this nonfiction story to life and Chris Hsu's illustrations make this a charming and enlightening picture book.